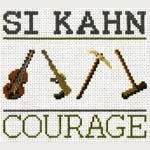 Si Kahn is an organizer, and an activist. He's also a poet, a songwriter, a preservationist, a historian, a documentarian in song. He's a stark realist, and simultaneously an unflinching optimist. The tender reverence he holds for the people whose struggles he has facilitated spills over into his songwriting, keeping their stories alive, connecting us to them - and ultimately, ourselves. This record is like a great meal, or an epic movie. It satisfies on so many levels. There are moments of light and gentle humor, wry wit, soul-searching and questioning, deep longing and poetic lyricism. Musically, the performances sparkle, the acoustic instruments are hooky and add interest, but never overpower the lyric and spirit of the songs. Si has done a difficult thing here: with ease and grace, he's told a heroic story by looking through small windows into the lives of everyday people. People like you and me, or maybe our family members, our ancestors or our children. This is a record about what sustains the human heart - the big and small moments that keep us going when things get hard, that keep us connected to the bigger story, our own history, and each other. But it's also a beautiful collection of stories. The listener is drawn in from the opening track, "Otis is Flying," a quirky imagining of "the existential angst of the Labrador Retriever." It is a sweet, affectionate pondering of human-ness and dog-ness, an easy gateway to draw us into this journey, to prime us to want to hear more. Next, "Stones in the Furrow" lays out the fundamental theme running through this album: "What do you do when you're finally forced to choose, when either way you win, and either way you lose." These are people who don't have easy choices, whose lives are squeezed down, people caught between a rock and a hard place. The record segues after that, into stories of immigrants, ancestors, the struggles of those that laid the foundations and fought for the basic human rights that we live with every day. -- The Italian immigrant woman in "Sail Away" who moved here (like my grandparents) with great hope, only to find the stark reality of the life of the immigrant laborer was not the paradise they dreamed of in the old country. The beautiful brass is an unexpected and perfect sonic choice, underscoring our peek into the heart of this woman. -- The Molly Maguires in Eastern Pennsylvania, whose desperation spilled over into rage and ultimately violence. They paid the ultimate price for trying to fight for a decent wage and basic human rights. We see their fear and defiance, all melded together. We glimpse their human-ness, which reflects our own. -- The son whose memory of a life-changing journey with his father, an unemployed Irish World War II veteran, in "Shoulders," during a labor march from Liverpool to London, challenges us to remember on whose shoulders the human rights we sometimes take for granted today ultimately rest. The larger story is historical, but the intimacy of this relationship is something we recognize. We understand them. They could be us. -- The cotton farmer struggling through drought ("On This Old Farm"). Si makes us instantly care about him. He springs to life and we recognize, in his poignant sarcasm and staunch determination, a deep reaching of life for itself, the tenacious refusal to succumb to death or defeat. -- The custodian, who gives us a glimpse into that unquantifiable-yet-tangible loss we all suffer when the financial bottom line becomes the only criteria for decisions made by our institutions. When those doing the work become unattached to those they're working for, everyone suffers a tragic loss: a subtle yet precious gift of connection with our own communities. -- The Irish immigrant yearning for the essence of her/his youth and home in Dublin, the "Ireland of My Dreams." Then we travel with Si to the small town of Taylor Texas, where 150 immigrant children -- babies, toddlers, teenagers -- are locked up in cells in a for-profit "detention facility." Although the song ends on a painful note, the real-life story has a happier ending: after a national campaign organized by Grassroots Leadership, the nonprofit organization Si founded and led for 30 years, the Federal government recently announced that all the children and their parents would be released, and that they would withdraw plans to build three new immigrant family detention centers. This is the moment where we get to see most clearly the passion that fuels Si's life's work, through song, and story, and plain old elbow grease. Si is a master at shining a light on injustice, and holding it there. But more than that, he is like a Pied Piper of sorts, articulating and holding a vision of what could be with such a fierceness and clarity that we want to get on that train with him, to be part of his world, and the world he sees that could be. The next vignette places us on a New York city street corner, and we are there with him listening to a woman quietly telling the story of a NYC factory fire, and the immigrant workers trapped there. The indelible scars left on her by that day reflect back to us the scars of similar desperate situations, and visual images of days like 9/11, and we realize we are connected, through history and humanity, by our collective human anguish. Our story unfolds from there with a WV trucker who works long hours and takes solace in his visits with old friends, playing music. Now that is something I know a thing or two about, and Si captures the simple, deep joy in shared musical connection and celebration beautifully in this story. Music is sustenance for hard-working people, a language that connects us to each other and our shared history, and renews this man for the next leg of his trip. Then comes the sweet and tender tribute of the sailors on Lake Mendota to their elder and mentor, Spanish Civil War veteran Clarence Kailin. He is a hero to them, and they pay him the ultimate respect, dipping the sails as they pass by an imagined statue of Clarence on the shore, looking out towards the future. And then Si leads us across that threshold into our own chapter of this history, with "Hunter," a son's story of bonding with his father in the woods as a young man. There are life lessons learned, there is a rite of passage, there is character built by taking responsibility for the taking of the life of this animal. All this is artfully juxtaposed with his experience as an adult in Iraq, taking a life irresponsibly, through the failings of those who sent him there in the first place. Si gives us a tragic glimpse into the wounds that are left, all around us, to be carried as a burden by those who come back scarred in ways we cannot see on the outside, and how we are all diminished by that injustice. It is an intimate snapshot into the breaking of a person by war. One person. And we are left to intuit the awful price we are paying every day by multiplying this intimate snapshot by the thousands. There is the chilling last line, juxtaposed over a happy bluegrass banjo riff, beautifully illustrating our terrible dilemma: it's easier not to look too closely at this story - it's easier to pay attention to the happy music and look elsewhere. This close-up of modern war, and the questions it raises about the irresponsibility of that war, segues into a poetic portrait of Abe Lincoln, again echoing back to us from history the pressures of being President during extraordinary times, and tying us to him through that arc of time with the question: What would he think if he could see this country today, this Union that he worked so hard to preserve? And finally there's the song that ripped me open, as if the entire record had been only to prime me for this moment. "Peace Will Rise" is a masterpiece, a call to nonviolence, an articulation of the courage it takes NOT to throw the next blow. It is a reminder of the sheer strength it takes to choose not to soothe ourselves by escalating violence that may have been perpetuated on us. I am left with tears, but they're sweet tears, tears of compassion. Tears for the beauty of humanity, of the sacredness of everyday life, for the reverence and the privilege of being human. We owe them, the people in these songs. We owe the brave workers who dug deep, who worked hard and still dedicated themselves, together, to the vision of a better life for the ones that came afterward: us. Si reminds us that we are, in all our messy, glorious humanity, unspeakably beautiful. And through the mirror of our history, he quietly hands us a gentle, firm, beautiful wake-up call. No hook, no anger, no hidden agenda, just the flame of a beautiful heart, calling to that flame in all of us. And just for today I can believe it, because I have seen it through his eyes. What a journey. What a sacred secular piece of work this is. What a poet. What a heart. What a soul.